3دانشیار گروه علوم خاک و مرکز پژوهشی گیاهان ویژه منطقه دانشکده کشاورزی، دانشگاه بیرجند. مدیریت تغذیه و اندازه بنه مادری، از مهم‌ترین عوامل مؤثر بر رشد و عملکرد زعفران به شمار می‌روند. به منظور بررسی اثر کمپوست زباله شهری و وزن‌ بنه مادری بر شاخص‌های عملکرد گل و ویژگی‌های رشدی بنه زعفران، آزمایشی در مزرعه تحقیقاتی دانشگاه بیرجند، در سال زراعی 94-1393 اجرا شد. آزمایش به صورت فاکتوریل در قالب طرح بلوک‌های کامل تصادفی با 4 سطح کمپوست زباله شهری (0، 5، 10 و 20 تن در هکتار) و 3 سطح وزن بنه مادری (شامل گروه‌های وزنی 4-1/0، 8-1/4 و 12-1/8 گرم) و در 3 تکرار اجرا گردید. صفاتی نظیر تعداد و عملکرد گل تر، طول و وزن کلاله، وزن بنه، تعداد بنه دختری و تعداد جوانه در بنه مورد ارزیابی قرار گرفتند. نتایج نشان داد که کمپوست زباله شهری بر وزن بنه همراه با فلس، تعداد بنه دختری و عملکرد گل تر و کلاله تأثیر معنی‌داری داشت، بطوریکه بالاترین وزن بنه همراه بافلس و تعداد بنه دختری (به ترتیب، 33/21 گرم در بنه و 11/2 عدد) از تیمار 10 تن در هکتار و پایین‌ترین آنها (47/16 گرم در بنه و 66/1 عدد) در شاهد به دست آمد. وزن بنه‌های مادری نیز، عملکرد گل وکلاله، وزن بنه و قطر بنه دختری را تحت تأثیر معنی دار خود قرار داد، بطوریکه بالاترین وزن تازه و خشک کلاله (به ترتیب، 31/0 و 11/0 گرم در متر مربع) از بنه‌های 12-1/8 گرم و کمترین آن‌ها (06/0 و 03/0 گرم در متر مربع) از بنه‌های 4-1/0 گرم بدست آمد. همچنین، اثر بر‌همکنش وزن بنه و کمپوست زباله شهری بر عملکرد گل و کلاله زعفران معنی‌دار گردید، بطوریکه بیش‌ترین عملکرد گل و کلاله تر (به ترتیب 36/9 و 41/0 گرم در متر مربع) از تیمار 10 تن در هکتار کمپوست و بنه‌های 12-1/8 گرم بدست آمد. بر اساس نتایج این تحقیق، استفاده از کمپوست زباله شهری (10 تن در هکتار) و بنه‌های مادری درشت (12-1/8 گرم) به عنوان مؤثرترین تیمارها در این آزمایش، می‏توانند نقش مؤثری در افزایش رشد بنه و عملکرد گل زعفران داشته باشند. 1Masters Student Horticultural Science (Medicnal plants), College of Agriculture, University of Birjand, Iran. 2Assistant Professor, Department of Horticultural Science and Special Plants Regional Research centre, College of Agriculture, University of Birjand, Iran. 3Associate Professor, Department of soil Sciences and Special Plants Regional Research centre, College of Agriculture, University of Birjand, Iran. 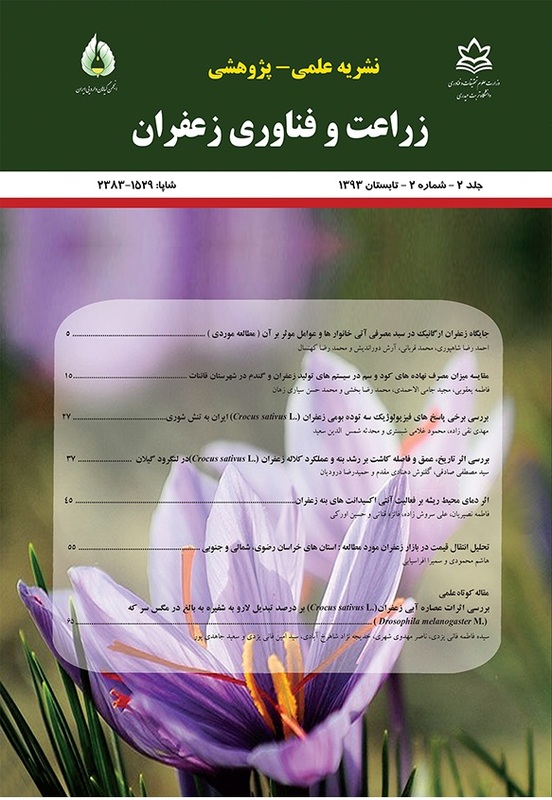 In order to investigate the effects of different municipal waste compost levels of and maternal corm weights on yield and vegetative characteristics of saffron, an experiment was conducted with a factorial arrangement based on randomized complete block design with three replications at the Agricultural Research Station, University of Birjand during the growing season of 2014-2015. The treatments were four levels of municipal waste compost (0, 5, 10 and 20 t.ha-1) and three mother corm weights (0.1- 4, 4.1- 8 and 8.1- 12 g). The traits included the number of flower, fresh weight of flower, stigma and fresh weight of corm with scale, weight and diameter replacement and number of buds. The results showed that the effect of municipal waste compost was significant on total weight corm with scale, diameter of center corm and replacement corm, weight of fresh flower and stigma. The highest corm weight and number of replacement corms were obtained for treatment 10 t. ha-1 compost (21.33 g. plant -1 and 2.33 number, respectively), while the control had the lowest values (with 16.4 g. plant -1 and 1.66 number). The effect of mother corm weight was significant on the vegetative characteristics of saffron. The highest corm weight with scale, diameter of replacement, flower yield and fresh weight of flower and stigma were observed for 8.1-12 g. The most fresh and dry weight of stigma (0.31 and 0.11 g. m -1, respectively) were observed from treatment mother corm weight 8.1-12 g, while the lowest values (0.06 and 0.03 g. m -1) were 0.1- 4g. Interaction between municipal waste compost and corm weight had a significant effect on the weight of fresh flower, sepal, stigma and the number of lateral buds and the highest fresh weight of flower (9.36 g. m-2) and stigma (0.41 g. m-2) were observed for treatment 10 t. ha-1 and 8.1-12g. Generally, the findings of the current study revealed that the use of municipal waste compost (10 t. ha-1) and large mother corms (8/1-12 g) had positive effects on corm growth and flower yield of saffron. Alavi Shari, J., Mohajeri, H., and Falaki, M.A. 1994. Effect of plant density on saffron yield. In: Proceedings of the Second Conference of Saffron and Medicinal Plants Cultivation, Gonabad, Iran, 8-9 Nov 1994, 13-20. (In Persian). Alipoor Miandehi, Z., Mahmodi, S., Behdani, M. A., and Sayyari, M.H. 2013. Effect of manure, bio-and chemical-fertilizers and corm size on saffron (Crocus sativus L.) yield and yield components. Journal of Saffron Research 1 (2): 73-84. (In Persian with English Summary). Amiri, M.E. 2008. Impact of animal manures and chemical fertilizers on yield components of saffron (Crocus sativus L.). American-Eurasian Journal of Agriculture and Environmental Science 4: 274-279. Amirshekari, H., Sorooshzadeh, A., Modaress Sanavy, A., and Jalali Javaran, M. 2007. Study of effects of root temperature, corm size, and gibberellin on underground organs of saffron (Crocus sativus L.). Iranian Journal of Biology 19 (1): 5-18. (In Persian with English Summary). Azizi-Zohan, A.A., Kamgar-Haghighi, A.A., and Sepaskhah, A.R. 2008. Crop and pan coefficients for saffron in a semi-arid region of Iran. Journal of Arid Environments 72: 270-278. Bybourdi, A., and Malakouti, M.J. 2006. Investigation effect of source of different organic manure (manure, compost and vermicompost) on quantitative and qualitative ghermez azarshahr onion in tow condition banab and khosroshahr. 2006. Journal Soil and Water Science 21 (1): 41-51. (In Persian). Barker, A.V., and Bryson, G.M. 2006. Comparisons of composts with low or high nutrient status for growth of plants in containers. Communications in Soil Science and Plant Analysis 37: 1303-1319. Behdani, M. 2005. Agroecological zoning and monitoring of saffron yield fluctuations of in Khorasan. PhD disseration, Faculty of Agriculture, Ferdowsi University of Mashhad, Iran. (In Persian with English Summary). Behdani, M.A., Koocheki, A.R., Nassiri, M., and Rezvani Moghadam, P. 2005. Evaluation of quantitative relationships between saffron yield and nutrition (on farm trial). Iranian Journal of Field Crop Research 3:1-14. (In Persian with English Summary). Chen, S., Zhang, X., Pei, D., and Sun, H. 2005. Effects of corn straw mulching on soil temperature and soil evaporation of winter wheat field. Transactions of the Chinese Society of Agricultural Engineering 21: 171-173. De Juan, J., Moya, A., Lopez, S., Botella, O., Lopez, H., and Munoz, R. 2003. Influence of the corm size and the density of plantation in the yield and the quality of the production of corms of Crocus sativus L. ITEA. Producción Vegetal 99: 169–180. De-maastro, G., and Ruta, C. 1993. Relation between corm size and saffron (Crocus sativus L.) flowering. Acta Horticulturae 344: 512-517. Ghobadi, F., Ghorbani Javid, M., and Sorooshzadeh, A. 2015. Effect of planting date and corm size on flower yield and physiology traits of saffron (Crocus sativus L.) under varamin plain climatic conditions. Saffron Agronomy and Technology 2 (4): 265-276. (In Persian with English Summary). Ghiamati, G., Astaraei, A., and Zamani, G.2009. Effect of urban solid waste compost and sulfur on sugar beet yield and soil chemical of properties. Iranian Journal of Field Crops Research 7 (1): 153-162. (In Persian with English Summary). Gresta, F., Lombardo, G.M., Siracusa, L., and Ruberto, G. 2008. Saffron, an alternative crop for sustainable agricultural systems. Agronomy for Sustainable Development 28: 95-112. Hassanzade Aval, F., Rezvani moghaddam, P., Bannayan aval, M., and KHorasani, R. 2013. Effects of maternal corm weight and different levels of cow manure on corm and flower yield of saffron (Crocus sativus L.).Saffron Agronomy and Technology 1: 22-39. (In Persian with English Summary). Hassanzade Aval, F., Rezvani moghaddam, P., Bannayan aval, M., and KHorasani, R. 2014. Effects of maternal corm weight and foliar application on replacement corm characteristics and flower yield of saffron (Crocus sativus L.) in the first year. Journal of Saffron Research 2 (1): 73-84. (In Persian with English Summary). Hayes, A., Mancino, C., and Pepper, I. 1990. Irrigation of turfgrass with secondary sewage effluent: I. Soil and leachate water quality. Agronomy Journal 82: 939-943. Hemmati Kakhki, A. 2003. A review on 15 years saffron research. Khorasan research institute for food science and technology. Mashhad, Iran. p.125. (In Persian). Jahan, M., and Jahani, M. 2007. The effects of chemical and organic fertilizers on saffron flowering. Acta Horticulturae 739: 81-86. Jami-alahmadi, M., Behdani, M.A., and Akbarpour, A. 2009. Analysis of agronomic effective factors on yield of saffron agroecosystems in southern khorasan. 3nd International Symposium on Saffron. Krokos, Kozani, Greece, 20-23 May, 2009, p.14. Kafi, M., Rashed Mohassel, M.H., Koocheki, A., and Mollafilabi, A. 2002. Saffron: Production and Processing. Ferdowsi University of Mashhad Publication, Iran. (In Persian). Khoshgoftarmanesh, A., and Kalbasi, M. 2002. Effect of municipal waste leachate on soil properties and growth and yield of rice. Communications in Soil Science and Plant Analysis 33: 2011- 2020. Koocheki, A. 2013. Research on production of Saffron in Iran: Past trend and future prospects.Saffron Agronomy and Technology 1 (1): 3-21. (In Persian with English Summary). Koocheki, A., Jamshid Eyni, M., and Seyyedi, S.M. 2015. The effect of mother corm size and type of fertilizer on nitrogen use efficiency in saffron. Saffron Agronomy and Technology 2 (4): 243-254. (In Persian with English Summary). Kumar, R. 2009. Calibration and validation of regression model for non-destructive leaf area estimation of saffron (Crocus sativus L.). Scientia Horticulturae 122: 142-145. Kumar, R., Virendra, S., Kiran, D., Sharma, M., Singh, M.K., and Ahuja P.S. 2009. State of art of saffron (Crocus sativus L.) agronomy: A comprehensive review. Food Reviews International 25: 44–85. Mashayekhi, K., and Latifi, N. 1995. Investigation of the effect of corms weights on saffrons flowering. Iranian Journal of Agricultural Sciences 28 (1): 97-105. (In Persian with English Summary). Molina, R.V., Valero, M., and Navarro, Y. 2005. Temperature effects on flower formation in saffron (Crocus sativus L.). Scientia Horticulturae 103: 361–379. Mollafilabi, A. 2004. Experimental finding of production and echo physiological aspects of saffron (Crocus sativus L.). Acta Horticulter 650: 195-200. Mollafilabi, A., and Shoorideh, H. 2009. The new methods of saffron production. The 4th National Festival of Saffron, Khorasan- Razavi, Iran, 27-28 October 2009. (In Persian). Mohammad-Abadi, A., Rezvani-Moghaddam, P., and Sabori, A. 2006. Effect of plant distance on flower yield and qualitative and quantitative characteristics of forage production of saffron (Crocus sativus L.) in Mashhad conditions. International Symposium on Saffron Biology and Technology739: 151-153. Munshi, A. 1994. Effect of N and K on the ﬂoral yield and corm production in saffron under rain-fed condition. Indian Arecant Spices 18: 24-44. Naghavi Maremati, A., Bahmanyar, M., Pirdashti, A H., and Salak Gilani, S. 2007. Effect of different rate and type of organic and chemical fertilizers on yield and yield components of different rice cultivars. Proceeding of 10th Iranian Soil Science Congress, Tehran, Iran, 26-28 Aug 2007, p. 766-767. (In Persian). Nassiri Mahallati, M., Koocheki, A., Boroumand Rezazadeh, Z., and Tabrizi, L. 2007. Effects of corm size and storage period on allocation of assimilates in different parts of saffron plant (Crocus sativus L.). Iranian Journal of Field Crops Research 5:155-166. (In Persian with English Summary). Nehvi, F.A., Lone, A.A., Khan, M.A., and Maqhdoomi, M.I. 2009. Comparative study on effect of nutrient management on growth and yield of saffron under temperate conditions of Kashmir. 3th International Symposium on Saffron: Forthcoming Challenges in Cultivation, Research and Economics. Acta Horticulture 850: 165-170. Omid Beigi, R. 2000. Production Method and Processing Medicinal Plants. volume 1. Fekre Rooz Publication. (In Persian). Patra, D., Anwar, M., and Chand, S. 2000. Integrated nutrient management and waste recycling for restoring soil fertility and productivity in Japanese mint and mustard sequence in Uttar Pradesh, India. Agriculture, Ecosystems and Environment 80: 267-275. Pedra, F., Polo, A., Ribero, A., and Domingues, H. 2006. Effect of municipal solid waste compost and sewage sludge on mineralization of soil organic matter. Soil Biology and Biochemistry 29: 1375-1382. Rangahau, M.K. 2003. Growing saffron - The world’s most expensive spice. Crop and Food Research 20: 42-49. Renau-Morata, B., Nebauer, S.G., Sanchez, M., and Molina, R.V. 2012. Effect of corm size, water stress and cultivation conditions on photosynthesis and biomass partitioning during the vegetative growth of saffron (Crocus sativus L.). Industrial Crops and Products 39: 40-46. Rezvani Moghaddam, P., Khorramdel, S., Amin Ghafori, A., and Shabahang, J. 2013. Evaluation of growth and yield of saffron (Crocus sativus L.) affected by spent mushroom compost and corm density. Journal of Saffron Research 1: 13–26. (In Persian with English Summary). Rezvani-Moghaddam, P., Huda, A.K.S., Parvez, Q., and Koocheki, A. 2007. Indigenous knowledge in agriculture with particular reference to medicinal crop production in Khorasan, Iran. World Association for Sustainable Development Conference Proceedings, Brisbane, Australia, 2007, p. 105-115. Rezaian, S., and Paseban, M. 2007. The effect of micronutrients and manure fertilizers on the quantity and quality of Khorasan saffron. Second International Symposium on Saffron Biology and Technology. Available at Web site http://www.civilica.com/Paper-Saffron02-Saffron02-020.html. Sadeghi, B. 1995. Effect of corm weight on saffron (Crocus sativus L.) flowering. Iranian Research Organization for Science and Technology-Khorasan, Mashhad Center, Iran. p.28. (In Persian). Seyyedi, M., and Rezvani Moghaddam, P. 2011. Investigation yield and component yield and nitrogen use efficiency in use of spent mushroom compost, biologic fertilizer and our in Triticum aestivum L. Journal of Agroecology 3: 309-319. (In Persian with English Summary). Sharifi Ashour Abadi, A. 1998. Evaluation of soil fertility in agroecosystems. PhD disseration, Islamic Azad Univesity of Oloum Tahghighat, Iran. (In Persian with English Summary). Singh, A., Bisen, S., Singh, R., and Biswas, S. 1998. Effectiveness of compost towards increasing productivity of some medicinal plants in skeletal soil. Advances in Forestry Research in India 18: 64-83. Teimori, S., Behdani, M.A., Ghaderi, M.G., and Sadeghi, B. 2013. Investigation on the effect of organic and chemical fertilizers on morphological and agronomic of saffron (Crocus sativus L.) corm criteria. Journal of Saffron Research 1: 36–47. (In Persian with English Summary).